(Nanowerk News) Could powering an iPod or cell phone become as easy as plugging it into your tee shirt or jeans, and then recharging the clothing overnight? Scientists in California are reporting an advance in that direction with an easier way of changing ordinary cotton and polyester into “conductive energy textiles” — e-Textiles that double as a rechargeable battery. Their report on the research appears in ACS’ Nano Letters ("Stretchable, Porous, and Conductive Energy Textiles"). Fabrics treated with this new electrically-conductive ink may power a new generation of futuristic clothing that charges iPods, cell phones and other electronics. 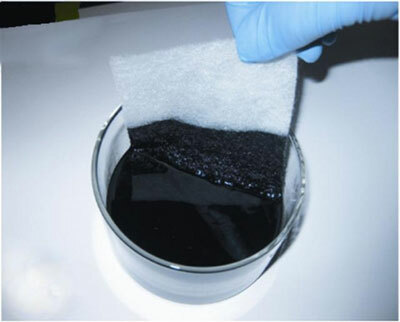 The report describes a new process for making E-textiles that uses “ink” made from single-walled carbon nanotubes — electrically conductive carbon fibers barely 1/50,000 the width of a human hair. When applied to cotton and polyester fabrics, the ink produced e-Textiles with an excellent ability to store electricity. The fabrics retained flexibility and stretchability of regular cotton and polyester, and kept their new e-properties under conditions that simulated repeated laundering.